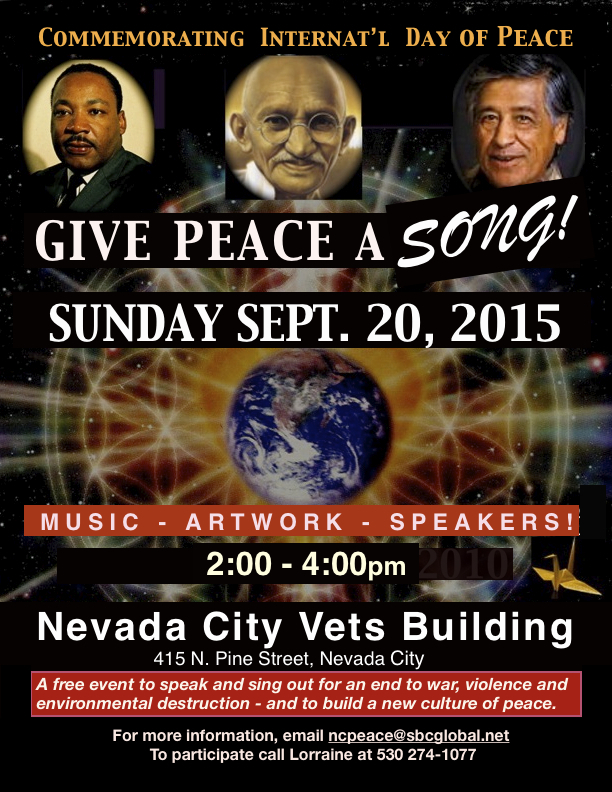 In commemoration of the International Day of Peace, the Peace Center of Nevada County hosts a community event to bridge the unrest and violence of the world with our visions for peace and social and environmental justice. The “Give Peace a Song” event provides a platform for local artists to display art that brings art and politics together in most creative ways. There are many reasons why we should care about art — first and foremost because artists have a lot to say, and through their art we are engaged in ways that expand our view of the world. Some say that art necessarily changes the world, but at the very least we are transformed in our thinking, concepts and world views. The program will feature local song writers and musicians sharing with us their expressions on these times with lively songs and music. Performers will include Catherine Scholz, Nory Fussell, the Peace Chorus, Jeffrey Gottesman, Bob Polucha, and more. There will also be a number of local community leaders who will speak on various topics that impact our world today. Among the speakers are Sharon Delgado, Reinette Senum, Bill Drake, and unconfirmed is Joanna Robinson. The new “Utah Phillips Peace Bench” project will be announced at the event.